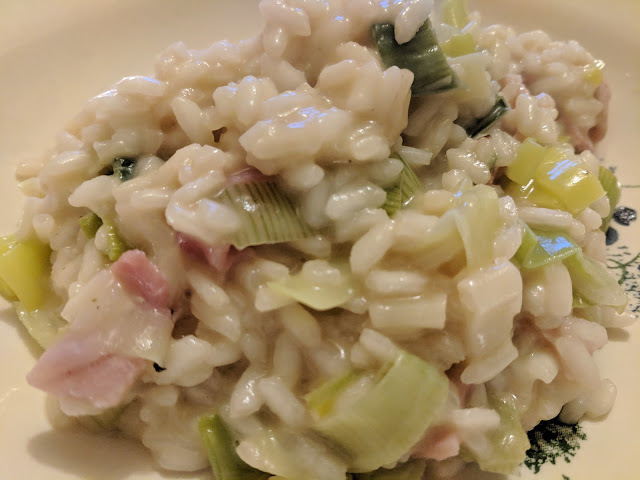 I think risotto dishes are the most comforting of comfort food. A big bowl of naturally creamy rice filled with your favourite ingredients and a single fork or spoon to eat it with. This contains bacon and leeks simply because that's was what was in our fridge at the time. You can substitute the leek for onion and add in other ingredients such as diced chicken or chorizo. Many risottos have white wine in them but this one doesn't. There's very rarely any wine in the house and I do think it is quite extravagant to open a bottle to put some in cooking. Chicken stock does a perfectly adequate job at a fraction of the price! 1. In the large saucepan heat the oil and butter. 2. Fry the leek for a minute before adding the bacon until it is cooked. 3. Add the rice and stir in. Cook for a couple of minutes. 4. Add a ladleful of the chicken stock and let the rice cook and absorb it. 5. Add more stock when the last lot has been absorbed. Continue this until the rice is plump and soft. 6. Stir in the cheese and add any seasonings as required.